John was left at an orphanage at a young age of ten by his mother because neither parent wanted him or his sibling’s. The mental, physical and sexual assaults he endured left him a very bitter, angry and hate filled person. Feeling alone and unwanted John was searching for a way to end his constant misery and depression. This is John’s journey to find peace of mind and freedom from his demons. 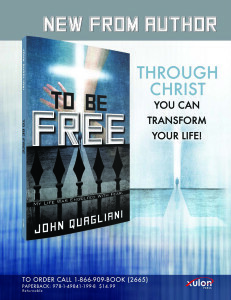 With his don’t quit attitude discover how Christ set him free. To Be Free is his story. Q. Why did the author write this book? A. Have you ever wondered what you could do when you knew you would not fail? God is like that, because he wants the best for each of us. Understanding this we cry out to God because life is difficult and we compound life by making bad decisions. 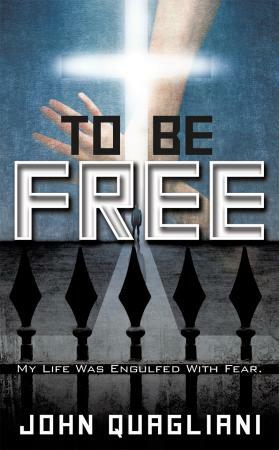 The purpose of the book “To Be Free” is to provide people who are having a difficult time with life a path to follow. When we focus on God we become all that God wants us to be. When you focus on the possibilities that God has laid out before you, you can see opportunities. Your view of the future becomes clear and joy filled when you make Jesus the pilot of your life. This book shows, no matter how bad things get, you can reach out to God and He will open your eyes and clear all your doubts. Q. What is most important about this book? A. To Be Free shows how a child born into an unloving family, became a Christ centered successful businessman. Each page will touch your soul and give you hope that you can do all things thru Christ. The book is peppered with Bible verses that motivate and encourage, which are followed by a brief interpretation. LUKE 15: 15-16 “Then he went and joined himself to a citizen of that country and he sent him into his field to feed swine. And he would gladly have filled his stomach with pods that the swine ate, and no one gave him anything”. These words show just how low we can get. When you are at the bottom with no place to turn, Jesus is with you. Look up with your hand out; He will lift you up. Q. Who is the author? A. This is an autobiography. Read how the author was abandoned by his unloving parents, left in an orphanage, was sexually assaulted while at that facility, and became a serious drug user for seventeen years. Yet with all these issues, with Gods help, he forgave all his tormentors. With Gods grace he completed his education and built a multimillion dollar business. Read how the author gave Jesus control of his life and business. Jesus was the C.E.O. and I was reporting to Him. Always remember “you can do all things thru Christ who strengthens you. With this bible verse remember, what ever fears you might be engulfed in, with God your fears melt away. With God as your C.E.O. and hard work you know your success is a matter of time.